Posted August 18th, 2011 by Codastar & filed under Codastar News. Do you depend on referrals from word of mouth and other kinds of recommendations to acquire new business connections and customers? Companies of all sizes across every industry find that a lot of their new business comes from a recommendation, whether it’s from an old customer, through networking organisations like the IOD, BNI and 4N or a supplier, the list really could go on and on! So, it’s important to make it possible for people to recommend your company to others at all times. Many people don’t realise that Facebook’s business tools actually create a brilliant referral network for you and your company. Although you may see Facebook as a tool to allow people from all over the globe to connect with one another, it is also a brilliant way of allowing people to connect with local businesses. There are many ways that Facebook is designed to make business referrals work well. Firstly, if someone “likes” your page, not only will you have more Facebook fans and friends, it will show on their profile that they’ve liked you. 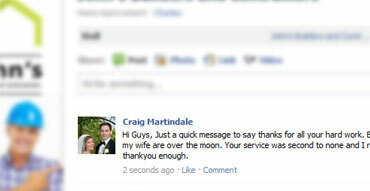 In this example the user Craig has liked your page and it is being displayed on his Facebook page. The fact Craig has liked your page will also show up on the “news” section of Facebook for all of his friends to see. What it means is: All Craig’s friends will receive an update on their Facebook in the “news” section saying that their friend “Craig” has “liked” you. Basically, the user “Craig” has approved of your company, and all of Craig’s friends receive a notice saying that Craig has chosen you! And that’s how it starts making great business sense to use Facebook for local referrals. This works in the same way if “Craig” writes something on your wall, it will also display on All of HIS friend’s Facebook “news feed” pages too! So, any testimonial posted on your facebook page immediately spreads through to all of that user’s friends. There are plenty of other things you can use your Facebook page for, and we’ve discussed reasons why your business needs Facebook in great depth in the past. However, it’s important to realise that as well as being a hub for content and a way to engage with your community, it’s also a great place to get referrals from others. As more and more businesses start to use Facebook it’ll become even more important to have a voice on what is fast becoming the biggest and most successful business referral network of the present day. To find out more about how Facebook can benefit your business, then get in touch with one of the Codastar team. We can tell you a little more about Facebook, or even set up a dedicated page for your business today.